Mt Everest base camp trek. 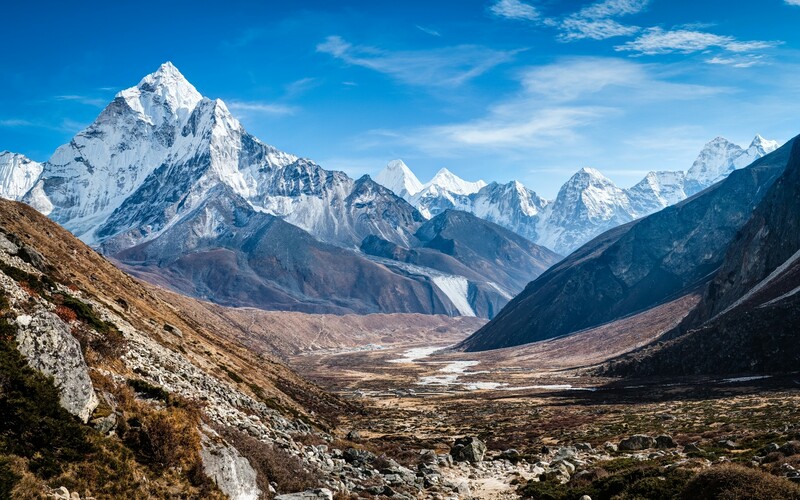 If you are looking for trekking in the Himalayas, there is no better place to go than the Mt Everest Base Camp which is the best trekking and hiking tours in the Mount Everest Region of Khumbu Valley and Sagarmatha National Park. The majesty of the mountains of this region and the thrill of trekking here brings a lot of passionate travelers to this place. You can also interact with many travelers and residents of the Mt Everest region while trekking to Everest Base Camp. You can experience the culture of Tibetan Buddhism of this region by traveling to various monasteries like Tengboche Monastery and Pangboche Monastery. Most of the trekking takes place within the boundaries of Sagarmatha National Park. While trekking, you are also likely to encounter different species of plants like juniper, fir, birch, rhododendron, etc. This national park also provides habitat for 118 species of birds. Besides, animals like snow leopard, red panda, musk deer, Himalayan wolves, etc. are also there in this national park. This trek has a wonderful mixture of scenic views, rich cultural heritage, and picture-perfect villages. These attractions make the EBC trek one of the most sought-after destinations for travel enthusiasts, And you will be proud when you see the highest mountain of the world along with your walk where Mount Everest height is measured 8,848 meters in almost into all the Mt. Everest trekking map. With appropriate preparation and trekking equipment, you can trek to Everest Base Camp any time of the year. But it is important for you to note that there are various seasons in the Everest Base Camp. The number of trekkers in the Everest Base Camp depends upon these seasons. Autumn (September/ October/ November) is the most popular season for trekking to the Everest Base Camp. This season experiences a low amount of rainfall and moderate sunshine making it a popular choice amongst trekkers. Spring (March/ April/ May) has weather that is similar to Autumn and is the second most popular season for trekking to EBC. Winter (December/ January/ February) can be quite cold. The temperature in places like Gorak Shep can get as low as -15 degrees C. But the low number of trekkers makes these months quite peaceful and popular amongst solitude-loving trekkers. Summer (June/ July/ August) is also a season where the trekking traffic is low as the monsoon rain makes trekking problematic for some. Trekking and hiking to the Mt Everest Base Camp is a moderately difficult trek. Moderate trekking destinations in Nepal take about 2 weeks to complete. A majority of moderate treks take place at altitudes of lower than 5000 meters. During the Everest Base Camp trek, you will reach a maximum altitude of 5545 meters in Kala-Patthar Khumbu icefall 5,486 meters on top the Khumbu glacier and slop of Mount Everest in Khumbu. During most days, your trekking will take place at altitudes that range between 2800 - 5000 meters. This makes you susceptible to Acute Mountain Sickness or Altitude Sickness. So to complete this trek, you have to ensure that you build your strength and stamina. For this, you need to start various forms of exercises like running, cycling, and strength training for around 3-4 months prior to departure. If you work on your fitness well and are mindful of your dietary habits, you will be able to complete the Mt Everest Base Camp trek quite easily. While trekking, don’t forget to hire a porter who will carry your load and reduce the physical stress on your body. Doing Mt Everest base camp trek has many routes. Jiri to Mount Everest base camp has developed from many years ago and still some trekkers prefer to star trek from that routes to observe the culture, nature and people inhabitants below the Lukla airport/Chaurikharka municipality. This trek is also meant perfect to acclimatize to trek to the Everest base camp. Nepal visitors who have a long time and have the willingness to trek to Everest base camp they start trek from Jiri with their trekking crews; guide porters and others necessary Nepali members. They have an everyday bus to Jiri and further up Shivalaya or Bhandara from Kathmandu. Another option is to hire a private jeep or micro bus to Jiri. As we said we have an optional route to Mt Everest base camp trek, flying to Phaplu is an optional way to trek to Everest base camp in case of Lukla weather is bad or you have the interest to see more about Solu, their inhabitants, culture, and natures. This trek also helpful to acclimatize and making fitness to walk in the high altitude and fulfill your desire to explore Solukhukhumbu district headquarter. The Option 3 Trekking to Mt Everest base camp trek is developed in 2019 after renovating the Airport of Ramechap in Solukhumbu district. This trek is quite closer than the trek that you star from Phaplu and Distance from Kathmandu to Ramechhap by jeep or by daily local bus and take a flight to Lukla cost you 149 USD. Sharing jeep from Kathmandu to Ramechhap takes 4 to 5 hours which cost you 30 USD by picking up you at the hotel. The Daily flight to Lukla has diverted to Ramechhap due to renovation stars of Kathmandu airport. Doing Everest base camp trek in 10 to 14 days trek or Gokyo valley trek from Lukla being organizing by Jeep to Ramechhap early in the morning and flights to Lukla back to Kathmandu by airplanes too. Our guide Porter team Lukla for Everest base camp trek, Gokyo valley trek or for all the Everest region trekking will be as it is. Our guide porter or porter will pick you at Lukla airport. Your trek starts after a thrilling and scenic flight to Lukla. You will get to explore a unique trading center in the Everest region named Namche Bazaar. It buzzes with tourists, flourishing trade, wonderful restaurants, and other beautiful facilities. Tengboche Monastery is the biggest monastery in the Everest region. It lies in front of the stunning mountains of the Everest region. Kala Patthar promises to be one of the best spots in the world for viewing sunrise. The views of the sun coming up through the Himalayas of this region is stunning. Khumbu Icefall and Glacier are other places of natural beauty during the EBC trek. You will also get to walk through Sagarmatha National Park. This park is a UNESCO Natural Heritage Site that is home to many exotic species of plants and animals. You will have a chance to learn the rich Tibetan Buddhism culture of this region while trekking. You will also get to experience an authentic village lifestyle while you visit many picturesque villages like Phakding, Dingboche, and Lobuche. Selected lodge, Home stay can will be provide and sometimes you have to sleep on the mated floor where local people used to. Toilet should be used where the local people suggested. Note: If you are curies to know, you have to inform/ better to ask your guide. The first day of your trek to Everest Base Camp starts after a flight from Kathmandu to Lukla. The flight is a relatively short one and lasts about 40 minutes. The flight will give you glimpses of the beautiful Himalayas in the Everest region. After that, you will head out to Phakding. Phakding is a small village in the Khumjung region. It a popular stopping point for tourists trekking to the Everest Base Camp. You will reach there after 3 to 4 hours of walk from Lukla. As Phakding is lower in altitude than Lukla, you won’t have to trek uphill. You will spend your night in Phakding. Namche Bazaar is where you will head out to the next day. The walk from Phakding to Namche Bazaar will start through a trail that takes you amidst pine forests in the Sagarmatha National Park. You will also encounter lush rhododendron and magnolia along the way that adds fragrance and beauty to the air during the trek. The trek primarily takes place along the banks of Dudh Koshi river. You will also encounter thrilling suspension bridges before reaching Namche Bazaar. Namche is referred to as the “Capital of Sherpas” and a great tourist hub in the Everest region. There are many quality restaurants, lodges, cyber cafes, and eateries in Namche. You’ll stay overnight in a guesthouse in Namche. Trekking to altitudes over 3000 meters can always bring about risks of altitude sickness. Therefore, you should spend a day in Namche Bazaar for acclimatization. This gives your body time to adjust to the low level of oxygen and cold temperature of this region. So you will roam around Namche Bazaar and visit some important places there. You will visit the Sherpa Museum this day. The museum contains many historical artifacts related to the Sherpa people. You will also hike up to Syangboche Airport. In the backdrop of the airport, you can see gorgeous views of the Himalayas of the Everest region. This day’s trek will also take you through a trail alongside the gushing water of Dudh Koshi. The trail will be mostly uphill. After trekking for approximately 7 hours, you will reach Tengboche. Tengboche is a village that is located at an altitude of 3800 meters in the Khumbu region. It is a place that is home to Tengboche Monastery. The monastery is the largest in the region and is an emblem of the Tibetan Buddhism of this region. The monastery contains beautiful panoramic views of the mountains in the Everest region like Mt. Everest, Mt. Ama Dablam, Mt. Cho Oyu etc. You will stay in a lodge in Tengboche this day. The start of your trek will be a pleasant one as you will descend down to Debuche. While trekking to Debuche, you will walk through lush forests of fir, birch and rhododendron. You will also see mountains like Everest, Lhotse, and Ama Dablam along the way. From Lobuche, you will walk to Pangboche to visit the Pangboche Monastery. Walking further, you will cross Imja Valley and Lobuche River. Finally, you will ascend upwards to Dingboche, where you will stay the night. Dingboche is a quaint village and a popular resting place for trekkers in the Everest region. Dingboche is located at an altitude of 4260 meters. As this is the first point along the trek where you cross the 4000-meter mark, it is very important for you to acclimatize in this region. Like the acclimatization day in Namche, your acclimatization day in Dingboche will also be quite thrilling. You will hike up to Nagarjuna Hill which takes about 4-5 hours. Nagarjuna Hill is an excellent viewing point of peaks like Island Peak, Makalu, and other mountains in this range. This will be a day to remember as you will reach to the Everest Base Camp this day. First, you will hike up to Gorak Shep from Lobuche. The hike will take about 3-4 hours and you will have a lunch at Gorak Shep. From Gorak Shep, you will walk along the Khumbu glacier and reach the Everest Base Camp. You are likely to encounter various mountaineering teams who have come for expeditions to Mt. Everest. Although, you won’t be able to see mountains of the Everest region from the Base Camp due to its geography, the view of Khumbu Icefall is breathtaking. After spending some quality time at the Base Camp, you will descend to Gorak Shep to spend a night. This day’s trek will start early in the morning. You will leave as early as 4 am to Kala Pathar. Kala Patthar is the best vantage point for viewing mountains in the Everest region from a close range. The gorgeous views of the sunrise over the Himalayas in the Everest region from Kala Patthar will be a memory of a lifetime. Kala Patthar is also the highest point along the trek and has an altitude of 5545 meters. The world’s highest webcam is also located in Kala Pathar. After taking some splendid photographs of the Everest and other peaks from Kala Pathar, you will descend to Pheriche. The trek from the 10th day onwards is downhill. You will lose an altitude of almost 800 meters this day while trekking to Pheriche (4288 meters) to Namche (3441 meters). Your descent will be through beautiful towns like Tengboche and Pangboche. The mountains of the Everest region will be visible while trekking down to Namche as well. This is the last day of your trek in the Everest region. You will trek from Namche Bazaar to Lukla. The trek is downhill and covers a distance of 18 kilometers. This is the longest day of the trek in terms of the distance. However, as the slope is downhill, you won’t experience any difficulties. It will take you around 6 to 7 hours to get to Lukla from Namche Bazaar. You will leave the Everest region on a scenic flight from Lukla to Kathmandu. The flight is around 40 minutes long. It is a scenic flight which offers you a bird’s-eye view of the mountains of the Everest region.